Ocho Rios is ideally located to explore the reefs & dive site just off the beaches and natural bays in Jamaica. Most of the hotels and villas in Ocho Rios are found on one of the many natural coves or bays. These holiday resorts have the beautiful torques sea on there door step and the beautiful hillside as it's back drop. You cannot ask for a more relaxing surroundings with luxury accommodations and picture postcard beaches. Ocho Rios is so named because of it's eight rivers which provide good feeding grounds where the river flow into the bays. Most of the best diving can be found in these locations because of the rich sea life that can be found around the reefs closest to these river outflows. Ocho Rios has a large cruise ship port with visitors coming from all over the world each week to enjoy all that Ocho Rios have to offer. You can take this opportunity to enjoy one of the many diving activities we have on offer or start your diving adventure with one of our scuba diving starter courses. Those looking for a bit more challenging dives can take a scuba diving trip to one of the wrecks or diving site off the shores of Ocho Rios. Ocho Rios Marine Park boundaries extend from the shoreline boundary of Mammee Bay and Drax Hall in the west, to Frankfort Point in the east and north to a depth of one thousand (1000) Metres. 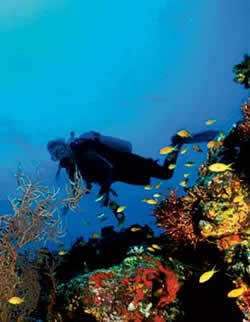 The Marine Park provide some of the best dive locations in Jamaica, with well preserved coral reefs and marine habitats. We provide you with a qualified Scuba Diving instructor who have years of experience teaching and supervising dive trips. 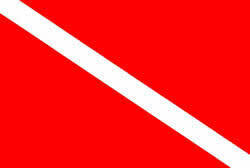 We provide all your dive equipment including tanks, diving suits (wet and dry suits), weight belts and flippers etc. You also get a fully equipped boat and crew, who will take care of you throughout the scuba diving trip and be your dive guide. Duration: 1:15 – 1:30 hour (include all equipment, boat ride and certified dive master). Duration: 3-4 days - (3-4 hours per day include all equipment, boat ride and certified dive master). Duration: 2-3 hours (include all equipment, boat ride and certified dive master). Duration: 2 tanks per day (include all equipment, boat ride and certified dive master). We offer pickup and drop off for our scuba Diving parties from the following Ocho Rios hotels and villas. We also pickup from other holiday properties not listed here, just ask when you make your enquiry.